Despite predictions that cosmetic procedures would face a decline due to an inclement economy and increased taxes, it appears that cosmetic procedures are at an all-time high with over 13 million procedures performed in 2011 (5% increase from 2010). Interestingly, minimally invasive procedures including injectable neurotoxins, soft-tissue augmentation, chemical peels and laser treatments increased by 123% from 2000, while traditional surgical procedures, including rhytidectomy and belphoroplasty, decreased by 17% over the past decade. Minor office-based procedures can give a more youthful appearance with minimal complications and downtime with the appropriate training. Highly effective procedures used for facial rejuvenation include injectable neurotoxins, soft-tissue fillers and chemical peels. OnabotulinumtoxinA (BoNTA-ONA; Botox/Botox Cosmetic, Allergan Inc., Irvine, CA, USA), abobotulinumtoxinA (BoNTA-ABO; Dysport, Medicis Aesthetics Inc., Scottsdale, AZ, USA) and incobotulinumtoxinA (BoNTA-INCO; Xeomin, Merz Aesthetics, Inc., Franksville, WI, USA) are injectable neurotoxins that have been approved by the United States Food and Drug Administration (FDA) for aesthetic purposes (glabellar lines) since 2002, 2009 and 2011, respectively; however, the list of "off-label" aesthetic applications continues to increase as patients demand full-face (as well as off-face) aesthetic rejuvenation. ,,, RimabotulinumtoxinB (BoNTB-RIMA; Myobloc, Solstice Neurosciences Inc., South San Francisco, CA, USA) is approved for cervical dystonia, but its use in aesthetic medicine is limited due to worse injection pain and lack of prolonged efficacy. Nevertheless, some practitioners use this product "off-label" for aesthetic purposes. Soft-tissue fillers are regarded as having an impressive ability to volumise and reshape ageing, sagging skin with a small time commitment and minimally reported side effects. , There are a variety of filling agents approved by the FDA for the correction of moderate-to-severe facial wrinkles (e.g. nasolabial folds) and are composed of different synthetic materials including hyaluronic acid (HA; Juvaderm Ultra, Allergan, Santa Barbara, CA, USA), poly-L-lactic acid (PLLA; Sculptra, Dermik Laboratories, Bridgewater, NJ, USA), calcium hydroxylapatite (CaHA; Radiesse, Bioform Medical, Inc., Franksville, WI, USA) and polymethylmethacrylate (PMMA; Artefill, Suneva Medical, San Diego, CA, USA). Although not FDA approved for facial aesthetics, silicone is used "off-label" for cosmetic purposes such as the treatment of acne scars or facial augmentation. Office-based, minimally invasive procedures are usually performed safely and effectively. However, even with pristine techniques, there are associated complications that are important to recognize and understand the causes in order to prevent their occurrence or provide appropriate treatment. Serious adverse events (SAEs) reported to the FDA of BoNTA for both therapeutic and cosmetic uses over a 13.5-year time period and non-SAEs over a 1-year time period were analysed in an extensive review. There were no reported deaths from cosmetic use of BoNTA, and of the 36 reported SAEs, 30 were cited as possible complications of the FDA-approved label while the other 6 reports were deemed unrelated to the drug treatment. Commonly reported non-SAEs included lack of effect, injection site reaction and ptosis. Therapeutic uses had more SAEs, including 28 deaths, most likely a result of the larger doses required for therapeutic use and the underlying disease state of patients requiring treatment. An earlier meta-analysis of randomised controlled trials for therapeutic uses of BoNTA substantiated the long-term safety profile. Despite the lack of reported SAEs for dermatological use, all neuromodulators have an FDA-mandated black box warning indicating the potential for distant spread resulting in swallowing or breathing difficulties and the risk of death. Injection site ecchymosis reportedly occurs in less than 1% of all injections and can be reduced by avoidance of medications with anticoagulant properties [e.g. aspirin and nonsteroidal anti-inflammatory drugs (NSAIDs)], herbal supplements (e.g. vitamin E, gingko, kava), smoking and alcohol for 7-10 days before the procedure. , Cold compresses and direct firm pressure immediately after injection can also mitigate the risk of post-injection bruising. 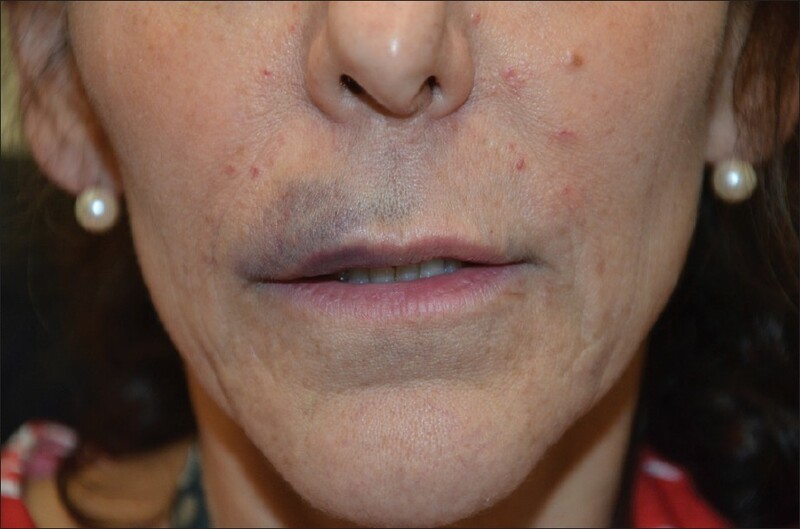 Even with the use of proper technique and careful patient selection, the periocular, perioral and lid margins, composed of thin skin with superficial vessels, are very prone to ecchymosis. Up to 25% of patients have demonstrated bruising after receiving treatment of the crow's feet (periocular) with BoNTA-ONA. Similar rates occurred in the placebo group, implying that the ecchymosis resulted from the injection rather than the toxin itself. Those patients who desire a form of prevention for bruising can be treated pre-operatively with herbal remedies such as Arnica montanta and/or Bromelain, which have been shown to reduce bruising and swelling by both small clinical trials and anecdotally. ,, These products are available in over-the-counter regimens such as Bruiseguard MD, which combines a Bromelain complex and A. montana in an easy-to-follow 7-day treatment plan. Topical preparations of vitamin K and C are reported to be beneficial, but data are limited to suggest a clear-cut advantage. Headaches were the most frequently reported adverse event in the initial trials of BoNTA-ONA for the treatment of glabellar lines (BoNTA-ONA, 15.3% vs. placebo, 15.0%; BoNTA-ONA, 11% vs. placebo, 20%), which is most likely a result of the injection technique and not the drug itself. , A case report of five patients receiving BoNT treatment for cosmetic purposes described severe and debilitating headaches that resolved with appropriate therapy and were postulated to occur from either the microtrauma of needle penetration into the periosteum or toxin-induced muscle spasm. Fortunately, headaches are usually mild and require no specific treatment. As described, unwanted paralysis/weakness of neighbouring muscles can result in blepharoptosis; however, midbrow ptosis is, in the author's opinion, more common and underreported in trials and clinical practice. More of a consequence then a complication, high-dose treatment of the eyebrow depressors (orbicularis oculi, depressor supercilii, procerus and corrugator muscles) with concurrent high-dose treatment of the mid-frontalis may subsequently lower the midbrow and cause elevation of the lateral eyebrow (spock effect). This may be prevented by injecting small doses of BoNTA lateral to the temporal fusion lines above the lateral eyebrow at the initial visit. 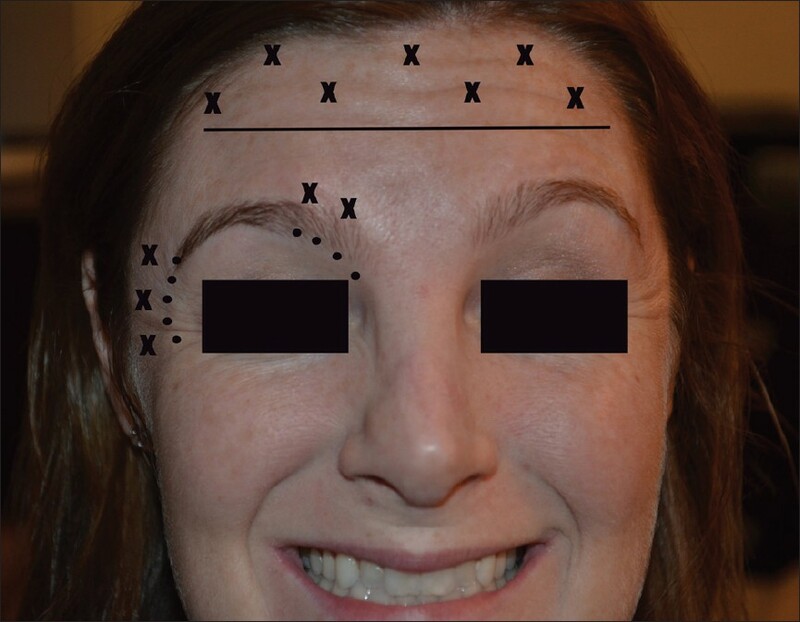 Lateral eyebrow ptosis has been reported in 5% of 183 patients undergoing treatment for periocular lines (crow's feet) in an early dose finding study with BoNTA-ONA. Unfortunately, in the literature, there is little mention regarding the incidence of lateral eyebrow elevation from overzealous eyebrow depressors and/or mid-frontalis treatment. 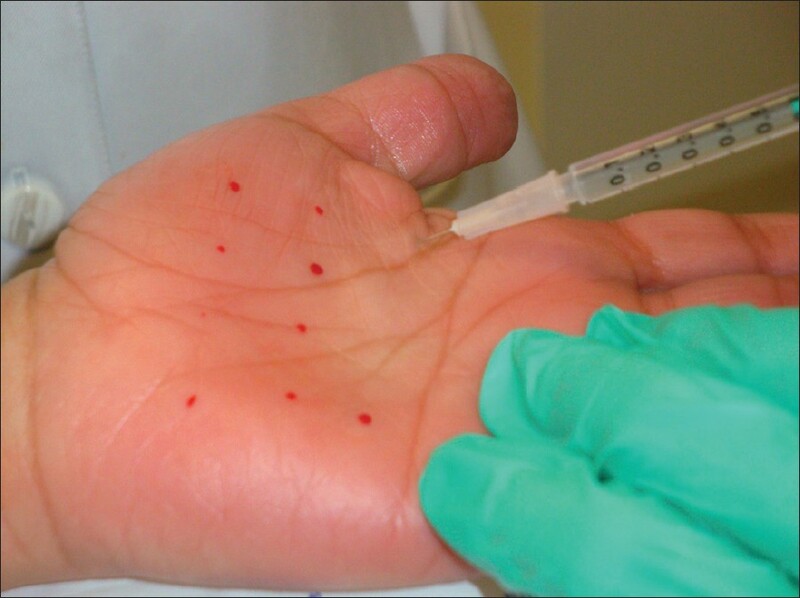 Injection into the palmoplantar region for hyperhidrosis can result in temporary hand weakness and reduction in fine motor skills which can last several weeks; thus, injection sites should be spaced appropriately and injections should be placed superficially [Figure 2]. , Recently, a 17-year-old girl reported the inability to engage in cellular communication via texting following BoNT-A injection. Full disclosure of possible complications is necessary when using neurotoxin for cosmetic purposes. Demand for soft-tissue fillers continues to increase, specifically because they are a safe, easy and non-invasive alternative to surgical modalities for facial augmentation and/or volume improvement. Filler efficacy has been demonstrated through multiple clinical trials and has the ability to provide dramatic instantaneous results (HA and CaHA) and prolonged improvements (PLLA and PMMA) with impressive safety profiles when proper injection technique is adhered to. 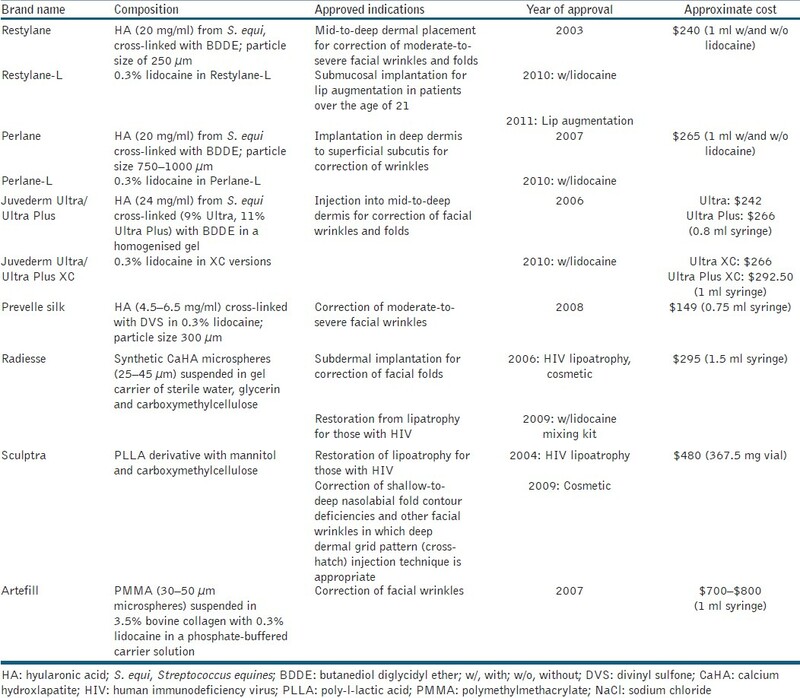 The armamentarium of FDA-approved soft-tissue fillers is extensive, and each varies in composition and approved uses [Table 2]. Reported complications following soft-tissue augmentation are unique and a likely consequence of poor injection technique, the filler material itself, or improper procedure sterilisation. Each filler product has unique complications due to the composition of the product, injection techniques and dilutions [Table 3]. Local injection site reactions such as swelling, bruising, pain and pruritus are the most commonly reported adverse events [Figure 3]. These reactions can be prevented through proper technique including slow and precise injections, use of a small-gauge needles, immediate application of cold compresses or pressure to the area following injection, and stopping the use of alcohol, aspirin or an alike blood-thinning agent 7-10 days before injections. In a clinical trial comparing a collagen (Zyplast, McGhan Medical Inc., Santa Barbara, CA, USA) and an HA-filler (Restylane Q-Medical, Uppsala, Sweden) in the treatment of nasolabial folds, 90.6% and 93.5% patients, respectively, experienced local injection site reactions following initial injection of 1 ml of product with a 30-gauge, 0.5-inch needle. These local reactions lasted less than 1 week and were classified as moderate-to-severe by patient-reported data. The incidence of infection following filler placement is low; however, reactivation of herpes simplex virus may occur, thus warranting either prophylactic anti-viral treatment for those with known outbreaks or procedure postponement for those with active lesions. Bacterial infection with Mycobacterium abscessus eported following soft-tissue augmentation with an unapproved product composed of Hyacell, an illegally imported HA derivative. Other soft-tissue infections of the face, including facial cellulitis and periorbital and buccal space abscesses, associated with soft-tissue filler placement were reported in a recent case series of 22 patients of whom 18 were hospitalised after injection with various filler agents including collagen, silicone, HA and autologous fat. A subset (n = 9) of these patients underwent their procedure at a non-medical facility, including from beauticians at salons, while the majority of this cohort (n = 13) received their treatment at a private plastic surgery or dermatology office. Practitioners should be wary of these potential complications in order to initiate and organise prompt medical treatment if necessary or refer patients for appropriate surgical treatment. Techniques to minimise the likelihood of this complication include aspirating before injection (although this may be difficult with more viscous fillers such as undiluted CaHA or silicone), using a small-gauge needle, minimising the volume of product used in one injection session, avoiding anaesthesia with epinephrine near a vascular bundle to prevent vasospasm and tenting the skin to avoid the vascular supply. Vascular occlusion must be treated emergently to give any chance of full recovery without serious long-term sequelae. Any concern for these complications, such as extreme pain, skin blanching and/or skin mottling, needs empiric treatment with rapid vasodilation as the primary goal. This can be accomplished by the application of warm compresses and/or nitroglycerin paste, taking an oral aspirin or clopidogrel and/or administration of hyaluronidase to relieve vascular compression if an HA material was used. Murine experiments suggest that early intervention with hyaluronidase is beneficial, but administration after 24 h is unlikely to help. Ulceration following skin necrosis can be treated supportively through wound care with wet-to-dry dressings or Xeroform™ (petrolatum gauze with 3% bismuth tribromophenate), emollients (e.g. biafine), topical antibiotics (e.g. silvadene, mupirocin) and debridement, if necessary, to facilitate healing. Most soft-tissue fillers are indicated for mid-to-deep dermal placement. If placed too superficially, complications such as visible product, nodule formation, hypertrophic scarring, and Tyndall effect (bluish discolouration from HA fillers) can occur. Attention to visual cues during injection, such as assessing the colour and shape of the needle and response of the subcutaneous tissue during placement, can help prevent misplaced products. Periosteal injection can avoid the majority of complications, but requires pristine placement and sufficient experience, as needles tapping the periosteum will dull quickly and potentiate pain during injection and increase the chance of a local skin reaction (e.g. bruising or swelling). Late-onset persistent nodules are a primary complication of PLLA, with development ranging from 5% to over 40% [Figure 5]. Fortunately, nodule development can be avoided through higher product dilutions (9-12 ml total volume per vial), product placement in the subcutaneous and periosteal planes, minimising volume during injection sessions and aggressive massage by the patient for several days after injection (minimum 5 times a day, 5 min at a time, over 5 days). ,, A retrospective review of over 100 patients injected with PLLA for aesthetic purposes found that nodules were most likely to occur in the hands (12.5%) and cheek (7.2%), so care should be taken when treating these areas. Injection into (or even close to) the lips should also be avoided with PLLA and CaHA, as nodule formation is most likely to occur. Silicone injections are still a popular permanent filler option. Liquid silicone for facial and body contouring became popular in the 1950s when it was deemed to be inert, permanent and non-pyogenic. Since then, many horror stories have been reported in the medical literature and through the media regarding cosmetic use of this substance. It should be noted that many of these devastating long-lasting complications stem from injection of large volumes of industrial-grade impure products from either unlicensed or unskilled practitioners. , Currently, liquid silicone products available in the United States include Silikon 1000 (purified polydimethylsiloxane; Alcon Laboratoires Inc., Fort Worth, TX, USA) and AdatoSil 5000 (Bausch and Lomb, Rodchester, NY, USA) and are FDA approved for retinal detachment. Any use of silicone for cosmetic purposes is considered "off-label," but experienced practitioners are dedicated to its use for soft-tissue augmentation, treatment of acne scars, lipoatrophy and correction of post-rhinoplasty nasal irregularities. Various modalities including systemic and intralesional corticosteroids, minocycline, anti-tumor necrosis factor antibodies or surgical removal can be employed to treat silicone granuloma formation. Treatment with minocycline 100 mg daily improved extensive facial granulomas after 4 weeks, and when continued for a total of 10 months, improvement was sustained 1 year after antibiotics' initiation. Oral corticosteroids may provide temporary improvement, but relapse often occurs during tapering and many patients are unable to tolerate the side effects of long-term therapy. Immunomodulating drugs, such as tumor necrosis factor inhibitors (e.g. etanercept) or imiquimod cream, are other potential treatment modalities that have been reported in the literature. ,, Imiquimod 5% topical cream applied twice daily for 2 weeks significantly improved extensive granulomas from an unapproved silicone injection on both the upper or lower lips. Surgical excision should be a last resort after medical treatment has failed, as scarring is a common disfiguring consequence. Chemical peels are increasingly popular for facial rejuvenation, as a solo treatment or in combination with topical regimens and/or with other minimally invasive techniques such as those described above [Table 4]. Complications from chemical peels include prolonged erythema and pruritus, delayed wound healing, infection, textural changes to the skin, induction of acne or milia, pigmentation changes such as post-inflammatory hyperpigmentation, and scarring. Deep chemical peels (e.g. phenol) necessitate specialised care such as cardiopulmonary monitoring, as phenol can enter the circulation resulting in cardiotoxicity. Practitioners should fully evaluate the patient's Fitzpatrick skin type and perform a complete history with emphasis on prior sun exposure including any history of blistering sunburns or skin cancers, isotretinoin use, keloid formation, post-inflammatory hyperpigmentation, poor wound healing, severe herpetic infections of the face or lips and habitual picking from compulsive personalities. Erythema and pruritus is a normal reaction to re-epithelialisation that usually subsides in 30-90 days depending on peel depth (typically sooner). This complication is easily managed by setting expectations before peeling, application of cool wet gauze or cold compresses as needed, administration of anti-itch creams and oral antihistamines, and keeping the skin moist with non-irritating emollients similar to petrolatum or topical barrier repair/emulsion creams such as Biafine (Ortho Dermatologics, Los Angeles, CA, USA) or Eletone (Ferndale Laboratories Inc., Ferndale, MI, USA). For deeper peels (e.g. phenol, TCA >30% peels, or combination peels), it may be necessary to provide oral anti-anxiety medications (e.g. benzodiazepines) or oral sleeping agents (e.g. zolpidem, trazodone or doxepin) for those with compulsive picking or anxiety during the healing phase. Persistent erythema is common in deeper dermal peels including combination Jessner's plus TCA peels, especially if multiple coatings are applied. Setting expectations before peel application is extremely beneficial, as patients will appreciate being informed of what to expect in the post-peel period [Figure 7]. Erythema can easily be treated with topical corticosteroids, continued emollients, sun protection with hats and sunscreens, as well as cosmetic camouflage. If severe erythema, pruritus or pain persists beyond 3-7 days post-peel, evaluation for contact dermatitis or infection (i.e. fungal, viral, bacterial) is mandatory. If induration is appreciated in association with erythema, this may indicate impending scar formation and oral, injectable or topical corticosteroids may be necessary to prevent scar formation. Scars are the most dreaded complications of chemical peels and are fortunately rare, reportedly occurring in less than 1% of medium-depth peels (e.g. Jessner's solution or GA plus TCA 35%). Higher concentrations and multiple applications of any peeling agent should be utilised with caution, as this technique is more likely to result in complications. Application to areas other than the face (e.g. neck) or around the eyes (e.g. periorbital) can be fraught with more severe complications when not preformed conservatively. Facial scars are most commonly found in the lower part of the face due to active moments during wound healing. Avoidance of isotretinoin for at least 6 months before peeling can reduce the risk of scarring. Treatment strategies for resulting scars include the use of occlusive covers (e.g. silicone gel), intralesional triamcinolone (±5-FU), laser treatment, radiation, surgical excision or topical imiquimod cream. 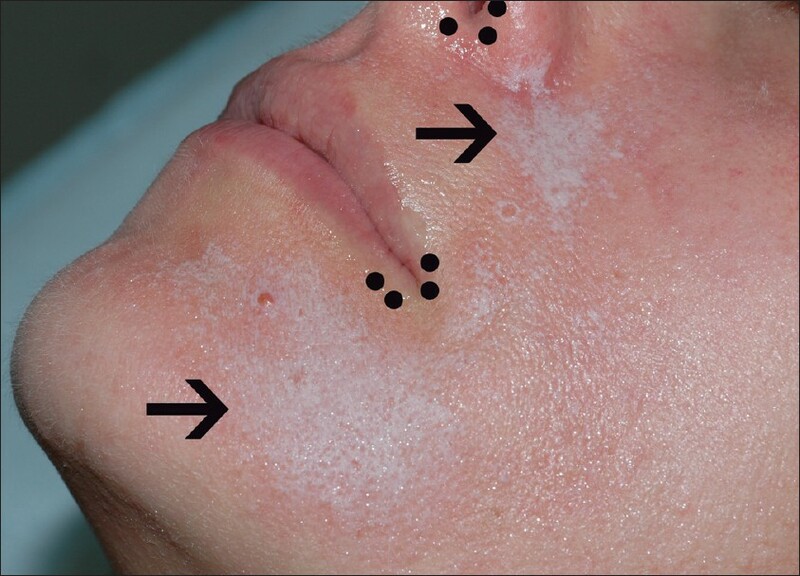 Dyspigmentation such as hypopigmentation or hyperpigmentation can occur following a peel of any depth and is more likely to occur in patients of Fitzpatrick skin types IV-VI. Hyperpigmentation is often temporary and results from post-inflammatory changes, but the use of bleaching creams (e.g. hydroquinone, kojic acid, azelaic acid and/or ascorbic acid) and sun protection can help. Hypopigmentation is a manifestation of melanocyte destruction from deeper chemical peels and presents as an unfortunate challenge to treat. The 308-nm xenon chloride excimer laser is a ultraviolet laser which can selectively target hypopigmented patches and is a treatment for lesions commonly seen in vitiligo and pityriasis alba (PA). After biweekly treatment with the excimer laser for 3 months in 12 pediatric patients with PA, there was an extensive decrease in facial hypopigmentation and some with complete resolution. There were no SAEs, and side effects including erythema or a "warm sensation" post-treatment were short-term, implying that this modality may be a possible option for facial hypopigmentation resulting from chemical peels. Testing the product before use, priming the skin with hydroquinone and/or tretinoin cream at least 2-4 weeks before superficial and medium-depth peels, and proper peel selection rather than using a similar peel for every patient can help avoid unnecessary pigmentary changes. Bacterial and viral infections have rarely been reported in association with chemical peels. Reactivation of herpes simplex virus can be prevented with anti-viral prophylaxis such as valacyclovir 500 mg twice daily starting 2-3 days before the procedure and finishing 7 days post-procedure. Bacterial infections such as staphylococcal folliculitis are usually a result of improper wound care or predisposing factors such as acne, carrier states or history of eczema, and should be cultured if possible and treated with empiric antibiotic therapy (e.g. cephalosporin or doxycycline). Office-based, minimally invasive techniques are in high demand since they provide a quick and reliable service for skin care rejuvenation with low risk of complications and high patient satisfaction. However, as with any surgical procedure, complications can occur and should be discussed before procedure initiation. Proper patient selection is of utmost importance, as is significant knowledge of facial anatomy, skin pathology, and procedure techniques and options. Immediate recognition and treatment of complications can help minimise the likelihood of permanent consequences. With significant patient demand and the rising rates of non-trained practitioners performing these procedures, the recognition and management of complications will become increasingly important in clinical practice. BoNT, botulinum toxin; FDA, Food and Drug Administration; HA, hyaluronic acid; PLLA, Poly-l-lactic acid; CaHA, calcium hydroxylapatite; PMMA, polymethylmethacrylate; GA, glycolic acid; SA, salicylic acid; TCA, trichloroacetic acid; SAE, serious adverse event; NSAIDs, nonsteroidal anti-inflammatory drugs; 5-FU, 5-fluorouracil; nm, nanometer; PA, pityriasis alba. 1. American Society of Plastic Surgeons. 2011 Cosmetic Plastic Surgery Statistics. Available from http://www.plasticsurgery.org/Documents/news-resources/statistics/2011-statistics/2011-cosmetic-procedures-trends-statistics.pdf. [Last accessed on 2012, March 17]. 2. Lu DW, Lippitz J. Complications of botulinum neurotoxin. Dis Mon 2009;55:198-211. 3. Botox Cosmetic [package insert]. Irvine, CA: Allergan; 2011. 4. Dysport[package insert]. Scottsdale, AZ: Medicis Aesthetics Inc; 2009. 5. Xeomin[package insert] Franksville, WI: Merz Aesthetics, Inc; 2011. 6. Alster TS, Lupton JR. Botulinum toxin type B for dynamic glabellar rhytides refractory to botulinum toxin type A. Dermatol Surg 2003;29:516-8. 7. André P. Evaluation of the safety of a non-animal stabilized hyaluronic acid (NASHA - Q-Medical, Sweden) in European countries: A retrospective study from1997 to 2001. J Eur Acad Dermatol Venereol 2004;18:422-5. 8. Bray D, Hopkins C, Roberts DN. A review of dermal fillers in facial plastic surgery. Curr Opin Otolaryngol Head Neck Surg 2010;18:295-302. 9. Berson DS, Cohen JL, Rendon MI, Roberts WE, Starker I, Wang B. Clinical role and application of superficial chemical peels in today's practice. J Drugs Dermatol 2009;8:803-11. 10. Kessler E, Flanagan K, Chia C, Rogers C, Glaser DA. Comparison of alpha- and beta-hydroxy acid chemical peels in the treatment of mild to moderately severe facial acne vulgaris. Dermatol Surg 2008;34:45-50. 11. Monheit GD. The Jessner's-trichloroacetic acid peel. An enhanced medium-depth chemical peel. Dermatol Clin 1995;13:277-83. 12. Aoki KR. Pharmacology and immunology of botulinum neurotoxins. Int Ophthalmol Clin 2005;45:25-37. 13. Carruthers JA, Lowe NJ, Menter MA, Gibson J, Nordquist M, Mordaunt J, et al. : BOTOX Glabellar Lines I Study Group. A multicenter, double-blind, randomized, placebo-controlled study of the efficacy and safety of botulinum toxin type A in the treatment of glabellar lines. J Am Acad Dermatol 2002;46:840-9. 14. Semchyshyn N, Sengelmann RD. Botulinum toxin A treatment of perioral rhytides. Dermatol Surg 2003;29:490-5. 15. Coté TR, Mohan AK, Polder JA, Walton MK, Braun MM. Botulinum toxin type A injections: Adverse events reported to the US Food and Drug Administration in therapeutic and cosmetic cases. J Am Acad Dermatol 2005;53:407-15. 16. Naumann M, Jankovic J. Safety of botulinum toxin type A: A systematic review and meta-analysis. Curr Med Res Opin 2004;20:981-90. 17. Klein AW. Complications and adverse reactions with the use of botulinum toxin. Semin Cutan Med Surg 2001;20:109-20. 18. Pena MA, Alam M, Yoo SS. Complications with the use of botulinum toxin type A for cosmetic applications and hyperhidrosis. Semin Cutan Med Surg 2007;26:29-33. 19. Emer J, Waldorf H. Injectable neurotoxins and fillers: There is no free lunch. Clin Dermatol 2011;29:678-90. 20. Söylev MF, Koçak N, Kuvaki B, Ozkan SB, Kir E. Anesthesia with EMLA cream for botulinum A toxin injection into eyelids. Ophthalmologica 2002;216:355-8. 21. Linder JS, Edmonson BC, Laquis SJ, Drewry RD Jr, Fleming JC. Skin cooling before periocular botulinum toxin A injection. Ophthal Plast Reconstr Surg 2002;18:441-2. 22. Wollina U, Konrad H. Managing adverse events associated with botulinum toxin type A: A focus on cosmetic procedures. Am J Clin Dermatol 2005;6:141-50. 23. Broughton G 2 nd , Crosby MA, Coleman J, Rohrich RJ. Use of herbal supplements and vitamins in plastic surgery: A practical review. Plast Reconstr Surg 2007;119:48e-66e. 24. Lowe NJ, Lask G, Yamauchi P, Moore D. Bilateral, double-blind, randomized comparison of 3 doses of botulinum toxin type A and placebo in patients with crow's feet. J Am Acad Dermatol 2002;47:834-40. 25. Kouzi SA, Nuzum DS. Arnica for bruising and swelling. Am J Health Syst Pharm 2007;64:2434-43. 26. Leu S, Havey J, White LE, Martin N, Yoo SS, Rademaker AW, et al. Accelerated resolution of laser-induced bruising with topical 20% arnica: A rater-blinded randomized controlled trial. Br J Dermatol 2010;163:557-63. 27. MacKay D, Miller AL. Nutritional support for wound healing. Altern Med Rev 2003;8:359-77. 28. Skinelite.com [internet]. ScarGuard Bruiseguard MD. Skinelite 2007. Available from: http://www.skinelite.com/scar-004.html. [Last accessed on 2012 April 2]. 29. Cox NH, Duffey P, Royle J. Fixed drug eruption caused by lactose in an injected botulinum toxin preparation. J Am Acad Dermatol 1999;40:263-4. 30. LeWitt PA, Trosch RM. Idiosyncratic adverse reactions to intramuscular botulinum toxin type A injection. Mov Disord 1997;12:1064-7. 31. Ahbib S, Lachapelle JM, Marot L. [Sarcoidal granulomas following injections of botulic toxin A (Botox) for corrections of wrinkles]. Ann Dermatol Venereol 2006;133:43-5. 32. Li M, Goldberger BA, Hopkins C. Fatal case of BOTOX-related anaphylaxis? J Forensic Sci 2005;50:169-72. 33. Carruthers JD, Lowe NJ, Menter MA, Gibson J, Eadie N. Botox Glabellar Lines II Study Group. Double-blind, placebo-controlled study of the safety and efficacy of botulinum toxin type A for patients with glabellar lines. Plast Reconstr Surg 2003;112:1089-98. 34. Alam M, Arndt KA, Dover JS. Severe, intractable headache after injection with botulinum a exotoxin: Report of 5 cases. J Am Acad Dermatol 2002;46:62-5. 35. Huang W, Foster JA, Rogachefsky AS. Pharmacology of botulinum toxin. J Am Acad Dermatol 2000;43:249-59. 36. Ferreira MC, Salles AG, Gimenez R, Soares MF. Complications with the use of botulinum toxin type a in facial rejuvenation: Report of 8 cases. Aesthetic Plast Surg 2004;28:441-4. 37. Garcia A, Fulton JE Jr. 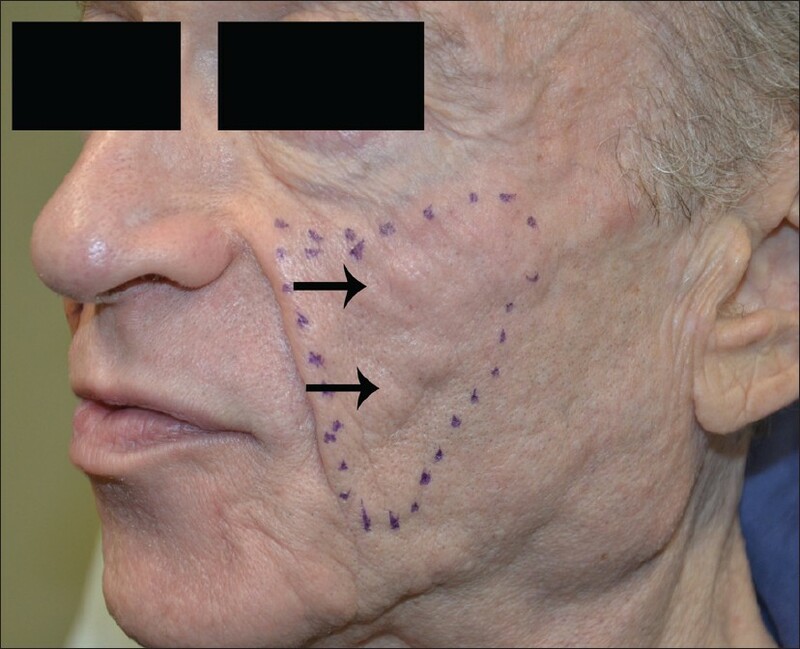 Cosmetic denervation of the muscles of facial expression with botulinum toxin. A dose-response study. Dermatol Surg 1996;2:39-43. 38. Sarrabayrouse MA. 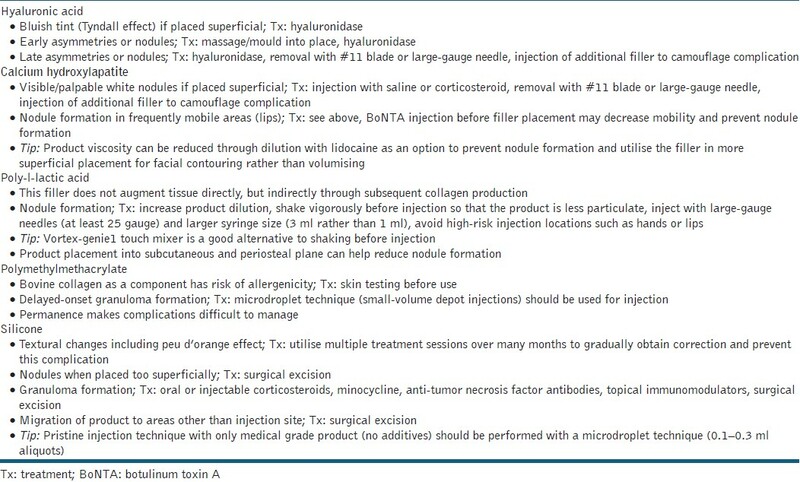 Indications and limitations for the use of botulinum toxin for the treatment of facial wrinkles. Aesthetic Plast Surg 2002;26:233-8. 39. Matarasso SL, Matarasso A. Treatment guidelines for botulinum toxin type A for the periocular region and a report on partial upper lip ptosis following injections to the lateral canthal rhytids. Plast Reconstr Surg 2001;108:208-14. discussion 215-7. 40. Klein AW. Complications with the use of botulinum toxin. Dermatol Clin 2004;22:197-205, vii. 41. Simonetta Moreau M, Cauhepe C, Magues JP, Senard JM. A double-blind, randomized, comparative study of Dysport vs. Botox in primary palmar hyperhidrosis. Br J Dermatol 2003;149:1041-5. 42. Lehman JS. Writer's block: "Texting" impairment as a complication of botulinum toxin type A therapy for palmar hyperhidrosis. Arch Dermatol 2011;147:752. 43. Narins RS, Brandt F, Leyden J, Lorenc ZP, Rubin M, Smith S. A randomized, double-blind, multicenter comparison of the efficacy and tolerability of Restylane versus Zyplast for the correction of nasolabial folds. Dermatol Surg 2003;29:588-95. 44. Toy BR, Frank PJ. Outbreak of Mycobacterium abscessus infection after soft tissue augmentation. Dermatol Surg 2003;29:971-3. 45. Schütz P, Ibrahim HH, Hussain SS, Ali TS, El-Bassuoni K, Thomas J. Infected facial tissue fillers: Case series and review of the literature. J Oral Maxillofac Surg 2012 [in press]. 46. Christensen LH. Host tissue interaction, fate, and risks of degradable and nondegradable gel fillers. Dermatol Surg 2009;35 (Suppl 2):1612-9. 47. Bachmann F, Erdmann R, Hartmann V, Becker-Wegerich P, Wiest L, Rzany B. Adverse reactions caused by consecutive injections of different fillers in the same facial region: Risk assessment based on the results from the Injectable Filler Safety study. J Eur Acad Dermatol Venereol 2011;25:902-12. 48. Cohen JL. Understanding, avoiding, and managing dermal filler complications. Dermatol Surg 2008;34 (Suppl 1):S92-9. 49. Narins RS, Jewell M, Rubin M, Cohen J, Strobos J. Clinical conference: Management of rare events following dermal fillers-focal necrosis and angry red bumps. Dermatol Surg 2006;32:426-34. 50. Glaich AS, Cohen JL, Goldberg LH. Injection necrosis of the glabella: Protocol for prevention and treatment after use of dermal fillers. Dermatol Surg 2006;32:276-81. 51. Kassir R, Kolluru A, Kassir M. Extensive necrosis after injection of hyaluronic acid filler: Case report and review of the literature. J Cosmet Dermatol 2011;10:224-31. 52. Kim DW, Yoon ES, Ji YH, Park SH, Lee BI, Dhong ES. Vascular complications of hyaluronic acid fillers and the role of hyaluronidase in management. J Plast Reconstr Aesthet Surg.2011;64:1590-5. 53. Gladstone HB, Cohen JL. Adverse effects when injecting facial fillers. Semin Cutan Med Surg 2007;26:34-9. 54. Bailey SH, Cohen JL, Kenkel JM. Etiology, prevention, and treatment of dermal filler complications. Aesthet Surg J 2011;31:110-21. 55. Zeichner JA, Cohen JL. Use of blunt tipped cannulas for soft tissue fillers. J Drugs Dermatol 2012;11:70-2. 56. Niamtu J 3 rd . Filler injection with micro-cannula instead of needles. Dermatol Surg 2009;35:2005-8. 57. Cohen JL, Brown MR. Anatomic considerations for soft tissue augmentation of the face. J Drugs Dermatol 2009;8:13-6. 58. Dadzie OE, Mahalingam M, Parada M, El Helou T, Philips T, Bhawan J. Adverse cutaneous reactions to soft tissue fillers-A review of the histological features. J Cutan Pathol 2008 ;35:536-48. 59. Sculptra[package insert]. Bridgewater, NJ: Dermik Laboratories; 2009. 60. Valantin MA, Aubron-Olivier C, Ghosn J, Laglenne E, Pauchard M, Schoen H, et al. Polylactic acid implants (New-Fill) to correct facial lipoatrophy in HIV-infected patients: Results of the open-labelstudy VEGA. AIDS 2003;17:2471-7. 61. Lam SM, Azizzadeh B, Graivier M. Injectable poly-L-lactic acid (Sculptra): Technical considerations in soft-tissue contouring. Plast Reconstr Surg 2006;118(3 Suppl):55S-63S. 62. Palm MD, Woodhall KE, Butterwick KJ, Goldman MP. Cosmetic use of poly-l-lactic acid: A retrospective study of 130 patients. Dermatol Surg 2010;36:161-70. 63. Narins RS, Beer K. Liquid injectable silicone: A review of its history, immunology, technical considerations, complications, and potential. Plast Reconstr Surg 2006;118(3 Suppl):77S-84S. 64. Anastassov GE, Schulhof S, Lumerman H. Complications after facial contour augmentation with injectable silicone. diagnosis and treatment. Report of a severe case. Int J Oral Maxillofac Surg 2008;37:955-60. 65. Schwartzfarb EM, Hametti JM, Romanelli P, Ricotti C. Foreign body granuloma formation secondary to silicone injection. Dermatol Online J 2008;14:20. 66. Duffy DM. Liquid silicone for soft tissue augmentation. Dermatol Surg 2005;31(11 Pt 2):1530-41. 67. Pasternack FR, Fox LP, Engler DE. Silicone granulomas treated with etanercept. Arch Dermatol 2005;141:13-5. 68. Chastre J, Basset F, Viau F, Dournovo P, Bouchama A, Akesbi A, et al. Acute pneumonitis after subcutaneous injections of silicone in transsexual men. N Engl J Med 1983;308:764-7. 69. Ellenbogen R, Rubin L. Injectable fluid silicone therapy. Human morbidity and mortality. JAMA 1975;234:308-9. 70. Arin MJ, Bäte J, Krieg T, Hunzelmann N. Silicone granuloma of the face treated with minocycline. J Am Acad Dermatol 2005;52(2 Suppl 1):53-6. 71. Desai AM, Browning J, Rosen T. Etanercept therapy for silicone granuloma. J Drugs Dermatol 2006;5:894-6. 72. Baumann LS, Halem ML. Lip silicone granulomatous foreign body reaction treated with aldara (imiquimod 5%). Dermatol Surg 2003;29:429-3. 73. Alam M, Gladstone H, Kramer EM, Murphy JP Jr, Nouri K, Neuhaus IM, et al. : American Society for Dermatologic Surgery. ASDS guidelines of care: Injectable fillers. Dermatol Surg 2008;34 (Suppl 1):S115-48. 74. Artefill Instructions for Use. Available at http://www.doctor.artefill.com/about-artefill/artefill-instructions-for-use. [Last accessed on 2012 April 3]. 75. Emer J, Waldorf H, Cohen J. Complications and their management. In: Sadick N, Carniol P, Roy D, Wiest L,editors. Illustrated Manual of Injectable Fillers. New York: Informa Healthcare; 2011. p. 141. 76. Leonhardt JM, Lawrence N, Narins RS. Angioedema acute hypersensitivity reaction to injectable hyaluronic acid. Dermatol Surg 2005;31:577-9. 77. Landau M. Cardiac complications in deep chemical peels. Dermatol Surg 2007;33:190-3. 78. Brody HJ. Complications of chemical resurfacing. Dermatol Clin 2001;19:427-38, vii-viii. 79. Camacho FM. Medium-depth and deep chemical peels. J Cosmet Dermatol 2005;4:117-28. 80. Al-Mutairi N, Hadad AA. Efficacy of 308-nm Xenon Chloride Excimer Laser in Pityriasis Alba. Dermatol Surg 2011; [in press]. 81. Landau M. Chemical peels. Clin Dermatol 2008;26:200-8.